Better known for its land and sea, the Caribbean is also home to a wealth of historic buildings. As a region colonized by Spanish, French, British, and Dutch settlers, its architecture reflects an unparalleled variety of colonial influences. Its buildings are also testimony to a history of slavery and constant immigration, revealing the legacy of African, Asian, and North American techniques. The wealth of the island’s sugar plantations has left behind a tradition of “great houses,” while inter-European conflict can still be traced to many well-preserved forts and naval bases. Spanish cathedrals and convents, Dutch gabled warehouses, English country houses, and French ironwork market buildings–all these have survived the perils of earthquakes and hurricanes. Featuring over one thousand architectural sites across the region, this comprehensive guide describes churches, plantation houses, fortresses, and ordinary homes. With a useful glossary of architectural terms and advice on what to look out for, it covers notable and interesting building on every island from the Bahamas down to Trinidad. 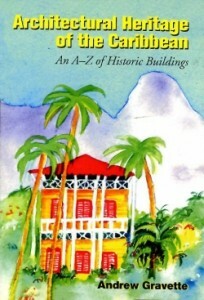 Illustrated with color plates and line drawings, Architectural Heritage of the Caribbean also traces the historical and economic developments that have created the region’s unique Creole styles. As governments and conservation societies look to the increasing potential of “heritage tourism,” this wide-ranging book provides an invaluable guide for visitors and students of architecture. Andrew Gravette is a writer and lecturer, specializing in the Caribbean region. He is the author of many books, including Cuba: The Official Guide.